Designing of the gracile alien’s limb development was the most tortuous process. This page features a hypothesis on Earth’s vertebrate limb development, and several ideas on branching that might have led to the gracile alien’s chain of long and short bones. None of these would make it; they are too boring and arbitrary. 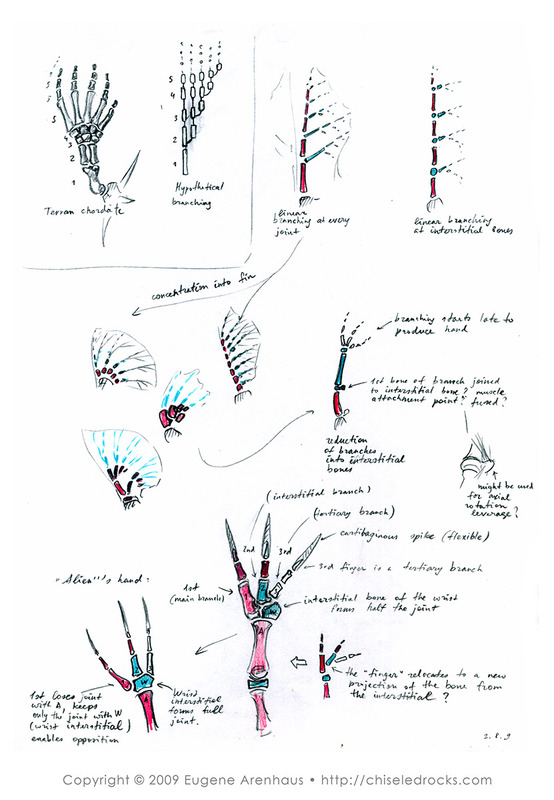 The interesting part of the page is the first attempt to figure out how the basic branching structure concentrates into the alien’s three-fingered hand, and the first appearance of the idea that some of the rudimentary “fingers” might have become attachment knobs for muscles.